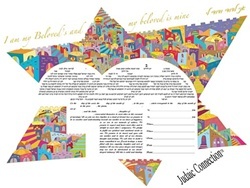 The Chai Star IV ketubah is a new design by artist Ruth Rudin. This ketubah is a giclee print. This design portrays a new modern formation of the famous Chai Star, with bright colors of Jerusalem as the background, and the text which forms into ''Chai'' (life) shape.